Connecticut is a state of the United States, part of the New England region. Connecticut was one of the thirteen colonies that revolted against British rule in the American Revolution. USS Connecticut was named in honor of this state. The name "Connecticut" comes from an Algonquin Indian word meaning "on the long tidal river". 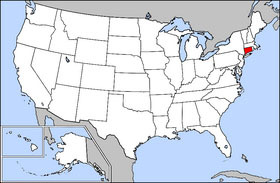 Connecticut was one of the original 13 states. The first Europeans to settle permanently in Connecticut were English Puritans from Massachusetts in 1633. Its first constitution, the "Fundamental Orders", was adopted on January 14, 1639, while its current constitution, the fourth for Connecticut, was adopted in 1965. The capital of Connecticut is Hartford and has been the sole capital since 1875. Prior to that, New Haven and Hartford alternated as capital. Unlike most other states, Connecticut does not have county governments; rather, there is the state government and then the government of the local municipalities. The current governor of Connecticut is M. Jodi Rell (Republican) and the two U.S. senators are Christopher J. Dodd (Democrat) and Joseph I. Lieberman (Democrat). Connecticut currently has five congressional delegates. Connecticut is bordered on the south by Long Island Sound, on the west by New York State, on the north by Massachusetts, and on the east by Rhode Island. The state capital is Hartford, and the other major cities include New Haven, New London, Norwich, Stamford, Waterbury, and Bridgeport. In all, there are a total of 169 incorporated towns in Connecticut. Connecticut's rural areas and small towns contrast sharply with its industrial cities. Many towns center around a small park, known as a "green". Near the green may stand a small white church, a town meeting hall, a tavern and several colonial houses. Forests, rivers, lakes, waterfalls and a sandy shore add to the state's beauty. Connecticut is an important center of the insurance and financial industries. Many inhabitants are employed in New York City. The total gross state product for 1999 was $151 billion, placing Connecticut 22nd in the nation. The Per Capita Income for 2002 was $42,706 giving Connecticut the highest Per Capita Income of the nation. The agricultural output for the state is nursery stock, eggs, dairy products, cattle and tobacco. Its industrial outputs are transportation equipment (especially aircraft), machinery, electrical equipment, fabricated metal products, chemical products, and scientific instruments. As of the 2000 census, the population of Connecticut is 3,405,565. Its population grew 3.6% (118,449) from its 1990 levels. According to the 2000 census, 81.6% (2,760,355) identified themselves as White, 9.4% (320,323) as Hispanic or Latino, 9.1% (309,843) as black, 2.4% (82,313) as Asian, 0.3% (9,639) as American Indian or Alaska Native, 0.04% (1,366) as Native Hawaiian or Pacific Islander 4.3% (147,201) as other, and 2.2% (74,848) identified themselves as belonging to two or more races. 6.6% of its population were reported as under 5, 24.7% under 18, and 13.8% were 65 or older. Females made up approximately 51.6% of the population.